Almost two-thirds of Chinese with more than $1.6 million in the bank have emigrated, or are planning to, according to research firm Hurun. 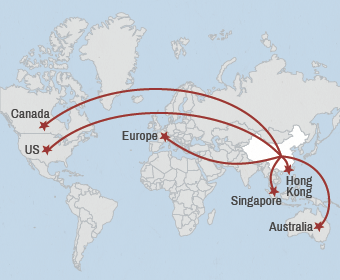 A growing number of wealthy Chinese are choosing to live and work abroad. Almost two-thirds of Chinese with more than 10 million yuan ($1.6 million) in the bank have emigrated, or are planning to, according to Hurun, a research firm that studies trends in China. The idea is less popular among the super rich. Only a third of those worth more than 100 million yuan ($16 million) say they want to emigrate. And moving abroad doesn't mean wealthy Chinese are leaving for good -- only 15% are planning to give up their nationality. So where are they heading? Europe has become more popular recently, while more traditional destinations are still proving attractive. Here are the hotspots. Source: Rankings based on Hurun Research survey of 393 wealthy Chinese conducted tween May and November 2013.